Zeiss, the optics company best known for its high-quality lenses, is trying to attract drone operators to its high-end Google Cardboard-compatible VR headset with a new app that lets them see from the sky. 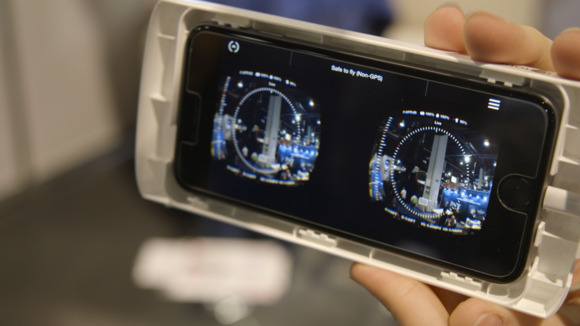 The Cloudlight FPV app lets iPhone users see from their drone’s point of view by connecting their phones to controllers for DJI Phantom or Inspire drones, and then sliding those phones into Zeiss VR One headsets. The app also displays key telemetry data so users can see important information from their aircraft, including battery power and signal strength. What makes Zeiss’s application really cool is that it lets you tilt the camera on the drone by tilting your head. The app uses the phone’s accelerometer to control the camera gimbal on the drone. There’s a little bit of a delay before the camera responds to a change in head position, but with the DJI Inspire drone I tested, it wasn't annoying. It is, however, a curious feeling to literally look down at yourself from a drone while standing on the ground. By pressing a button on a DJI controller, a user can switch from the drone’s-eye view to the docked smartphone's camera. That means people can see what’s going on in front of them, or check out a drone’s position from the ground to ensure that it stays away from obstacles without having to take off the headset. That’s especially important for people who have bulky glasses, since pulling a set of VR goggles off is a pain for us. 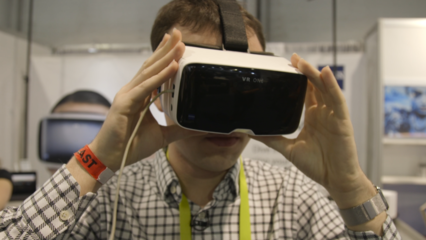 The VR One is a $129 headset that sets itself apart with its Zeiss lenses. Having been hands-on with the device, they’re incredibly clear, and Zeiss says they’re supposed to avoid requiring users to adjust their headsets for different distances between their pupils.